If you are an outdoors kind of person, the Island Ting tour is the tour for you. Combining sailing, snorkeling, and kayaking, the Island Ting takes you to the most beautiful natural areas surrounding Key West Florida. The tour starts off with a soothing sailboat ride out to the reef. Our boat is a spacious and luxurious 41-foot sailing catamaran yacht that transports a maximum of 20 passengers through the calm blue waters of the Gulf of Mexico. The destination is the Key West living coral reef ecosystem. This natural habitat is one of the most unique habitats in the country. Located just seven miles off the coast of Key West, the living coral reef ecosystem is a complex array of coral rock formations and reef species that live in harmony in a vibrant underwater wonder-world. Key West visitors looking to take a peek at this unique world are given this opportunity. Our expert crew will provide you with instruction and the best tips for snorkeling. Guests are provided with complimentary, sanitized snorkel gear and before they know it, they are swimming just a few feet from an underwater world unlike any other. After snorkeling, the Island Ting tour heads out to the Key West backcountry. This is an area just north of Key West that is made up mostly of mangrove islands. 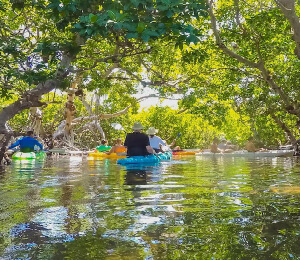 Guests jump on board our two-person kayaks and get the chance to explore the mangrove islands. You will get the chance to see a variety of seabirds that make their home here. This six hour eco-journey includes a full breakfast and a full buffet lunch (including delicious peel-and-eat shrimp and an assortment of deli meats and cheeses to make your own sandwiches). Water and soft drinks are provided throughout the day and on your way back to Key West, you will also be treated to your choice of premium beer, wine, and our delicious homemade sangria. The Island Ting is one of the best ways to experience the beautiful natural side of the Florida Keys! With only 20 spaces available each day, it is highly recommended to make your reservations in advance! I have been to the Bahamas many times, but Island Ting is one of my favorite trips! It includes everything that everyone should do here. As a Bahamas veteran, I can say only the best about this experience!